Log mark form used to register cattle brand. This is to Certify, That Henry Kissau of Hubbard Lake, Mich does in accordance with Act No. 202 of the Session Laws of the State of Michigan for the year 1867, select and adopt the following marks to be cut or stamped in conspicuous places, upon the ends of sides (or both) of logs to be put by or for him into Cattle Brand or tributaries for the purpose of floating or rafting to the place of manufacture or shipment. Said Marks ha--- been approved by the Officers of the Boom Co.
[brand design of a large K] exact size. Received for record this 18th day of December. A.D. 1923. 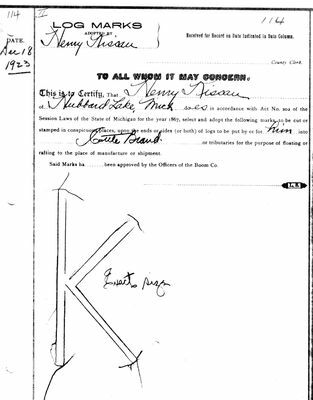 This is to certify that Henry Kissau of the County of Alpena and State of Michigan does select and adopt the following mark to be branded on the left hind hip of all cattle owned by him. [brand design of a large K] 4 1/2" x 2 1/2" Exact size.